Our latest release is a delightful and extraordinary piece of historical footnotery: a facsimile of a pamphlet printed in the UK in 1669, entitled The Flying Serpent, or Strange News Out of Essex. It concerns the appearance of a monstrous winged snake in a village close to the market-town of Saffron Walden and describes the reactions of the locals to it. 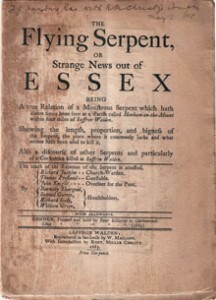 The anonymous authorÂ then details other extraordinary serpents that have been recorded as appearing in England, with particular reference to a Cockatrice that was killed near Saffron Walden itself, and describes other strange snake-like beings known to the ancients, including the scorpion and the rhinocerote. Yes. The Flying Serpent is a bit mad. Mad, that is, by the standards of the modern day. We think of 1669 as a time of post-Cromwellian enlightenmentâ€”after all people had, mostly, stopped burning each other at stakesâ€”but the concepts of science and the scientific process were in their infancy, the great bulk of information was still passed by word of mouth and almost everybody took mythology and folklore at face value. This is a charming example of that: the details of the serpent are mixed in with verses and quotations, and there’s no clear division between what is real and what’s conjecture, or even fact and fiction. It’s a fascinating and funny piece of historial triviaâ€”there’s even a joke about lawyers in itâ€”and we’re proud to make it available again after so long. Even if it does lead to yet more jokes about people from East Anglia. You can read more about The Flying Serpent by clicking here or buy a copy from DriveThruRPG for a modest $1.50 by clicking here. In From the Cold, a 112-page collection of Dave Morris’s classic articles and adventures from the golden age of White Dwarf magazine, will be appearing on shelves in the first week of November, and in ebook form around the same time. You can find out more about it here, order a print copy from our publishing partners here, or check out our range of ebooks at DriveThruRPG here.